A sod cutter is used in the preparation of new landscape beds, removing large swaths of lawn, clearing for a new sidewalk or driveway, as well as preparing athletic fields. The 18" wide blade makes short work of even the toughest project. Other features include 5 speed gear selection, simplified depth selection, and a pistol style handle arrangement. Machine has a maximum working depth of 2.5" and weighs 325lbs. We do carry ramps, which we rent out for an additonal charge. 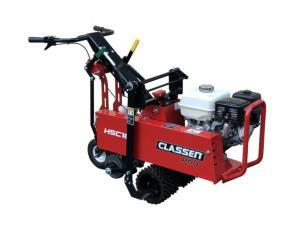 * Please call us for any questions on our sod cutter rentals in Hillsdale and Ridgewood NJ.